Blankets is the story of a young man coming of age and finding the confidence to express his creative voice. 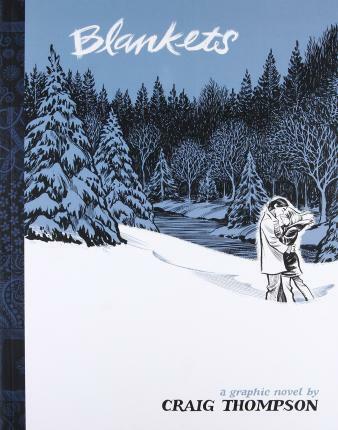 Craig Thompson's poignant graphic memoir plays out against the backdrop of a Midwestern winterscape: finely-hewn linework draws together a portrait of small town life, a rigorously fundamentalist Christian childhood, and a lonely, emotionally mixed-up adolescence. Under an engulfing blanket of snow, Craig and Raina fall in love at winter church camp, revealing to one another their struggles with faith and their dreams of escape. Over time though, their personal demons resurface and their relationship falls apart. It's a universal story, and Thompson's vibrant brushstrokes and unique page designs make the familiar heartbreaking all over again. This groundbreaking graphic novel, winner of two Eisner and three Harvey Awards, is an eloquent portrait of adolescent yearning; first love (and first heartache); faith in crisis; and the process of moving beyond all of that. Beautifully rendered in pen and ink, Thompson has created a love story that lasts. Craig Thompson is a cartoonist and the author of the award-winning books Blankets, Carnet de Voyage, Good-bye Chunky Rice, and Habibi. Thompson was born in Michigan in 1975, and grew up in a rural farming community in central Wisconsin. His graphic novel Blankets won numerous industry awards and has been published in nearly twenty languages around the world. Thompson lives in Portland, Oregon.